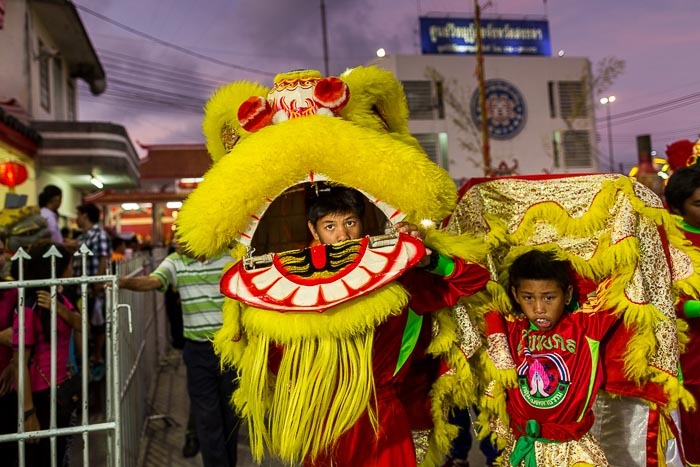 A lion dance at Lunar New Year festivities in Hat Yai. I went to Hat Yai to work on a couple of feature stories. It was mostly an excuse to get out of Bangkok and away from the whistle blowing protestors. I photographed Lunar New Year festivities in Bangkok and had a great time. What I didn't know when I made my plans for Hat Yai was that Lunar New Year there was a week longer than Lunar New Year in Bangkok. I got to Hat Yai for the last weekend of the Lunar New Year festival. Hat Yai is the biggest city in Songkhla province (Songkhla is the provincial capital) and the economic engine of southern Thailand. Hat Yai was settled by Chinese immigrants at the beginning of the 20th century and Sino-Thais are still the business leaders of the community. There are more Chinese style temples in central Hat Yai than Thai style temples. Even though Songkhla is the provincial seat, Hat Yai is the biggest city in the province (and 4th largest city in Thailand). 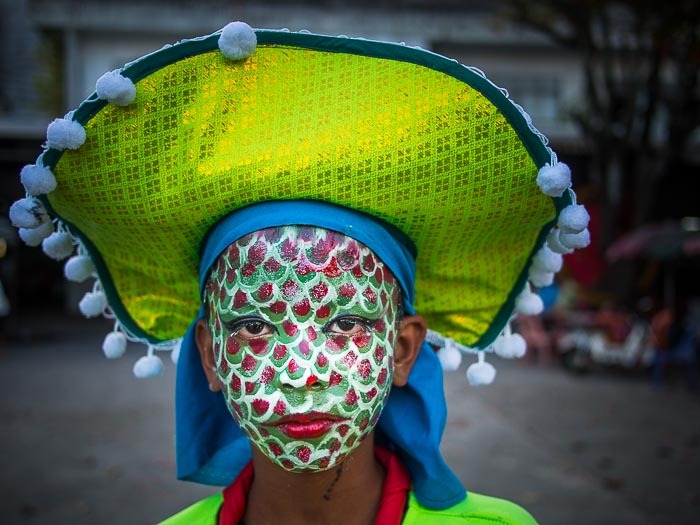 A folk dancer waits to perform at Lunar New Year in Hat Yai. Lunar New Year, Tet, Chinese New Year, call it what you will, is a big deal here. That's why the celebration goes on for almost two weeks. 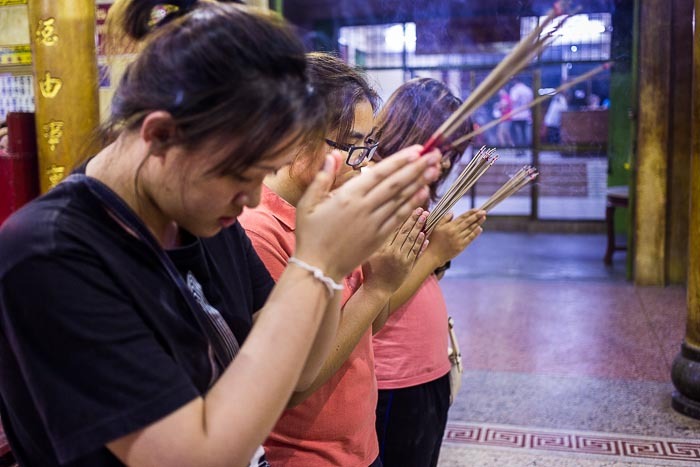 Women pray during Lunar New Year observances in a Chinese temple in Hat Yai. I found the party kind of by chance. I had an afternoon to kill in Hat Yai so I went walkabout and wandered down to a couple of street food stalls I like to visit when I'm in town. I turned a corner onto the street and saw Chinese style lanterns strung over it. I wandered down the street to see what was going on and ran smack into the party. Lion dancers wait to perform in front of a temple. I photographed the party Thursday night and again Sunday night. I missed it Friday and Saturday nights because I was editing work I had done earlier those days. It was a great party. I don't know if it's better than Bangkok's Lunar New Year bash but it's more accessible and feels more authentic. Lunar New Year in Bangkok is great but it's also a very commercial, tourism driven street food fair. In Hat Yai it doesn't feel quite as commercial, more like a community celebration. I consider myself lucky that when I plan these out of town trips because I almost always stumble into some unplanned event that turns out to be a highlight of the trip. 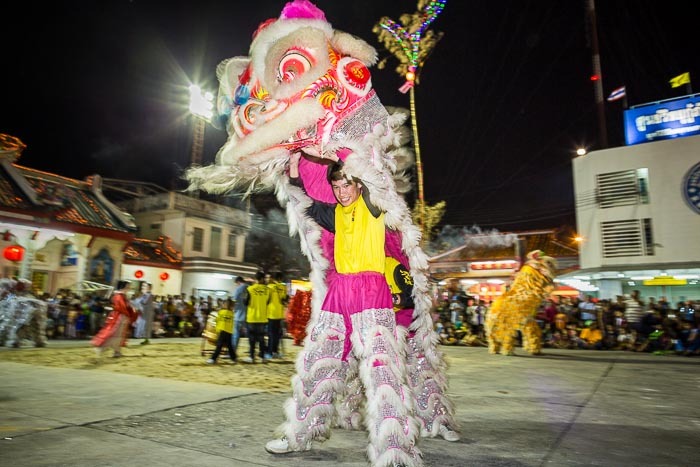 Lunar New Year in Hat Yai was certainly that for me on this trip. Now it's on my calendar. I think next year I'll skip Lunar New Year in Bangkok and head straight to Hat Yai.